CEFCU Stadium - Home of the Spartans is an outdoor athletic stadium in the western United States, located in San Jose, California. 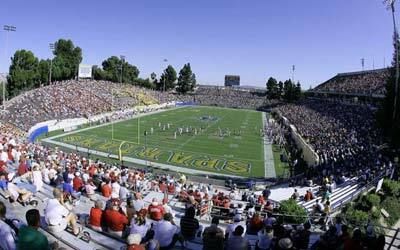 It is a venue of San Jose State University, the longtime home of the Spartan football (soccer teams play at Spartan Soccer Field). The stadium also hosts occasional high school football games, and the university commencement ceremony every year on Memorial Day weekend. Known as Spartan Stadium for over eight decades, it was renamed in 2016.